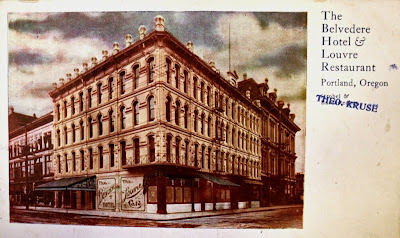 Two doors down from the Washington Block, at Fourth and Alder, was a hotel, the Holton House, (later the Belvedere) in one of the few cast-iron buildings as far west as Fourth Street. When it was built in 1885, the neighborhood was largely residential but was changing rapidly as downtown moved inland. Prior to the opening of Union Station in 1896, the hotel was the arrival and departure point for Southern Pacific's steam passenger trains on the West Side line to Beaverton, Hillsboro, McMinnville and Corvallis via a right of way down the center of Fourth Street. Tucked between the hotel and the Washington Block was one of the city's fine dining establishments; The Louvre. 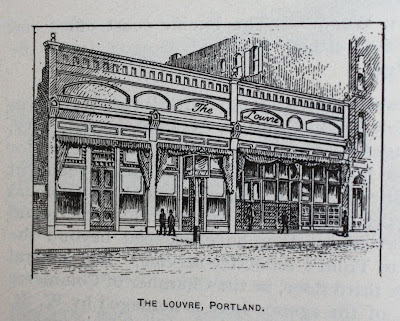 The Louvre was opened in 1892 by Frederick Strobel, who had worked previously at the Quelle Saloon on Second and Stark. A description in the Oregonian's Handbook on the Pacific Northwest (1892) gives a glimpse of late nineteenth century Portland nightlife, where office workers, travelers and after show crowds from the nearby Marquam Grand gathered for food, drink and entertainment. "Among Portland's places of amusement there is no resort which enjoys so high a reputation in its line as The Louvre, located on Fourth Street, between Washington and Alder. To all intents and purposes The Louvre takes the place of a well equipped club, with advantages not possessed by the later institution. Fine meals are served here during the day, at a reasonable price, and the best of spirituous and malt liquors and cigars are dispensed to patrons at the bar, or at private tables. Leading magazines and periodicals are kept on file at The Louvre for the accommodation of guests. In the evening at this popular resort, first-class concerts are given, free of charge, for the benefit of patrons who may be desirous of passing a few hours of pleasant relaxation. These concerts are varied occasionally by entertainments of a high order. The Louvre is conducted as a pleasant resort, which enjoys a high reputation, and is well worthy of the large patronage it receives." A menu at the Oregon Historical Society shows a wide range of dining options: seasonal pheasant, grouse, quail, goose, chicken, turkey, squab, five kinds of duck and superior snipe. Oysters (Toke Point or Eastern, Shoalwater Bay and Olympia) were prepared sixteen ways. Steak options included plain, sirloin, tenderloin, porterhouse and chateaubriand. Welch rarebit, mutton, spaghetti, frog legs and many more selections rounded out the fare. Wines from France, Germany and California's Napa-Sonoma Wine Company were offered as well as a large mixed drink and cordial list. Beer could be purchased by the pint or quart and included Guinness Stout, Bulldog (ale or porter), Budweiser, Olympia, Schlitz and Weinhard's Columbia. Four imported German beers were on tap. Locally brewed Gambrinus cost fifteen cents a pint, while Pabst Bue Ribbon went for a princely twenty five cents. The Belvedere Hotel and The Louvre. The building to the left was built on the original site of The Lourve and would later be home to The Circle Theatre. The entire half block between Alder and Washington Streets on Fourth was demolished in 1963 to build a parking structure. 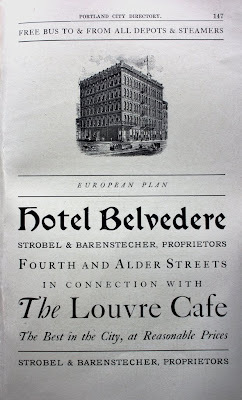 The Louvre moved next door into the first floor of the Hotel Belvedere in 1897. Fritz Strobel continued to run the enterprise until 1907 when Theodore Kruse took over. After a run of twenty two years, The Louvre closed in 1914, perhaps as the idea of serving French food with German beer was losing its plausibility. An advertisement in a 1906 Portland city directory from the central library. Thanks, Dan, for unearthing all this on the Washington block and environs. It even involved the Louvre! Good work! Thank you for sharing the interesting post.